A minor misfortune of my job since 2001 has been the title because no one outside the company would have any idea what it means: Newsbank editor. Or, worse, if someone has heard of NewsBank Inc., he or she might think my job was related. It wasn’t. There has never been any part of it related to NewsBank Inc. When Media General created a news-sharing intranet website in 1998, for whatever reason company officials chose to name it Newsbank (or, in public news releases, News Bank, though on the business cards presented to me when I first reported for work, it was Newsbank). So whenever I met someone and they asked what I did, I often thought of a line from an episode of the 1978-79 “Battlestar Galactica” (“The Long Patrol”) in which Starbuck lands on a prison planet where inmates’ names are derived from their crimes: “What exactly is Starbuckin’?” Before 2001, I could answer the “What do you do?” question with my actual title: “I’m a reporter.” “I’m the city editor.” “I’m the state editor.” Some further explanation might be tacked on, but the title conveyed basics. Starting in 2001, I skipped the title and launched into the explanation, and I quietly wished that back in 1998 someone had a different idea for the job title. Today I realized what that title could have been. Within Steve Buttry’s post about the new curation team at Digital First Media is a fairly good description, from Karen Workman (the third person in the post, if you go looking for it), of much of what I do (go down to the bold subhead “So how can we do this?”). Of course, Newsbank is old technology (the original 1998 coding was rewritten, but that still was almost 10 years ago) and not up to everything she describes as desireable, and I do other things during the day — increasingly and sometimes depressingly so. But basically, yeah, the essentials are parallel. Maybe I should unilaterally adopt the title and update my resume accordingly. Clearing my email this morning after a week away on vacation — during which I managed for the first time in 11 years to stay off the Internet (well, except for my 2-year-old non-smartphone’s minimal connectivity) — I found a link to an Editor & Publisher article about how to increase the number of young people who subscribe to a newspaper. There are some good nuggets from the two contributors in that article, but I remain skeptical that many newspapers are geared for this effort, for the simple reason that when push comes to shove, they are still putting out print products aimed at an audience that doesn’t watch TV or read anything on the Internet. Last week’s massacre at a movie theater in Aurora, Colo., provided the latest, but surely not last, major example. I woke on vacation, checked my phone and found a Washington Post news alert sent overnight about the shootings. We turned on CNN and watched coverage for several hours, until it seemed that little new detail was likely to come out soon, and then turned it off and went about our vacation day. The next morning I went out and bought a newspaper — a major regional newspaper based in a metropolitan area. The shooting coverage was the centerpiece, the top headline, and took up the majority of the page — and there was NOT ONE SINGLE WORD on the front page that told me anything I had not heard on TV before noon the previous day. Turning inside, there was a sidebar of new information — new to me, at least, who had not been watching TV or reading the Internet since before noon. The experience angered me, both as a reader who expected better and as an editor. My patience with newspapers was tried again when we returned home to find that our newspaper carrier had either not gotten word of our “vacation stop” or had ignored it and continued to deliver our paper. Why does anyone want to pay to have a daily alert to burglars piled up by the front door? Older readers who are already newspaper junkies may brush these off and keep their subscriptions, but a combination of spotty service and old news is no way to win new readers. The 2012 RJI Mobile Media News Consumption Survey brings some interesting mileposts on the evolution of mobile news use, but to me it seems to raise some questions too. Among the questions I have is whether print news organizations should be focusing on where their current audience is or where the potential audience is – and that’s a question that goes back decades. Among people who already subscribe to newspapers or news magazines, and who are over 35, tablets are a strong favorite – but if you focus on going after that group, what about the people under 35, who much more strongly favor using their smartphones rather than a tablet (57 percent vs. 28 percent)? 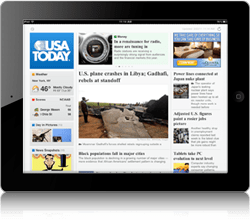 Smartphones also are nearly ubiquitous – owned by 92 percent of mobile news consumers, compared to the 40 percent who own tablets. Maybe if your mobile site is good, it doesn’t matter, but I haven’t heard that the industry is approaching the point where most mobile sites are considered to deliver a good experience. Until then, the few news sites that are good would seem to have an advantage in building a reading habit among a larger segment of the potential audience, leaving the industry still relying on a shrinking portion of the population. A focus on the tablet also could simply reinforce the old print newsroom habit of tailoring the work toward a particular time of day – except with tablets it is evening instead of morning. Smartphone users are roughly equally likely to check for news at various times of day, while half of tablet users wait until evening. Ultimately, this may come down to whether you think news will (or should) wind up primarily supported by subscriptions and some type of paywall or will (or should) remain largely free and supported by advertising. If the former, the ready niche – of older, presumably better-off readers accustomed to your style of product – is tablets. But even if that’s the better path in the short-term because it based on paid content now, not the promise of something uncertain later, it’s less of a digital transition unless your theory is that it is the best way to convince stubbornly print-oriented editors and publishers to begin tailoring their work toward a tablet-based digital audience, and that from there it then would be easier to get to an all-digital orientation from there than from where they are now. 7/13/12 UPDATE: I’d like to see more studies of the effects of paywalls on demographics, but one from Our Hometown about what happened to the online audience of the Times Record in Brunswick, Maine (that link goes to a PDF), should give everyone pause: When the paper’s website was free, the average age of users was 43, but after a paywall went up the number of young site visitors dropped off a cliff and the average age rose to 59.